During the 2015 holiday season, Greater Houston Orthodontic’s hosted an online Ugly Sweater Contest. Once the entries were in, contenders had their friends and family vote for them to determine who had the best – or worst? – ugly sweater! Congratulations to our contest winner, Chloe, who earned 218 votes! 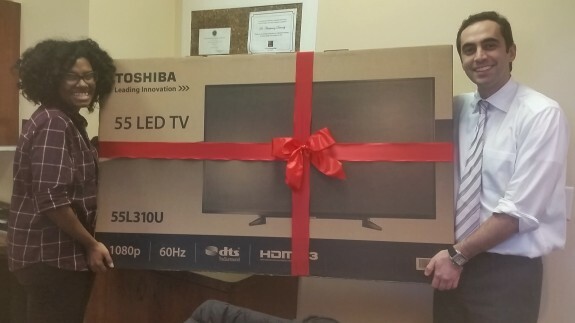 She won a 55″ LED TV. What a great Christmas gift! Check out Dr. Davoody giving Chloe her prize in the photo below. Our next contest is going on now. Test your Texas trivia knowledge for a chance to win a $100 gift card. Visit our Contest Page for more information.